Hand Made Sterling Silver Cuff Bracelet from Thailand, "Silver Pine"
Linking sterling strands, Achara's design evokes the texture of pine bark. Intricate yet simple, the cuff bracelet is a contemporary classic. 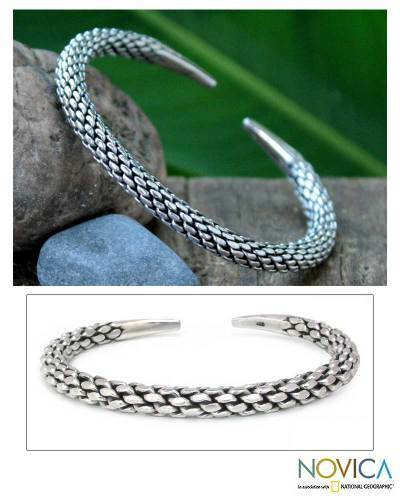 You can find sterling silver cuff bracelet 'Silver Pine' by Achara in jewelry categories such as No Stone Bracelets, Sterling Silver Bracelets and Cuff Bracelets. Enjoy exploring these sections for other Novica treasures. Basic Bracelet! Edgy Vibe Glamorous Hummingbird Theme Bracelet Simple Silver! Uncommon. Nice looking, interesting bangle.